We’d love your help. Let us know what’s wrong with this preview of Fractured Heart by Sienna Grant. No one would ever take her place but what happens when someone breaks down your defences and repairs your hea We had it all. To ask other readers questions about Fractured Heart, please sign up. Infelizmente esse livro não despertou em mim os sentimentos que eu esperava, estava no clima pra ler um draminha, mas esse aqui não rolou. Pra mim não teve emoção, achei tudo muito corrido e apressado. Não tive tempo de conhecer os personagens a fundo e ficou aquela coisa confusa e superficial e por conta disso, não consegui me conectar nem com os personagens e nem com a história. Achei a relação entre pai e filha fofinha e ok. Mas nada tãoooo emocionante quanto eu imaginava a princípio. Temas assim necessitam de delicadeza, sensibilidade e emoção... o que na minha opinião, faltou e faltou muito aqui. Reviewing on behalf of Amo's Book Corner. Fractured Heart is a soul wrenching story about a man named Owen who lost his wife, Victoria in the worst possible way - she died giving birth to their daughter Ella. For the first few years after Vic died, Owen wallowed in grief and despair. He wasn't living, but merely existing, simply on autopilot in the daily routine of looking after Ella and running his business. That is until he meets Grace. She turns his world upside down and makes him feel again a Reviewing on behalf of Amo's Book Corner. 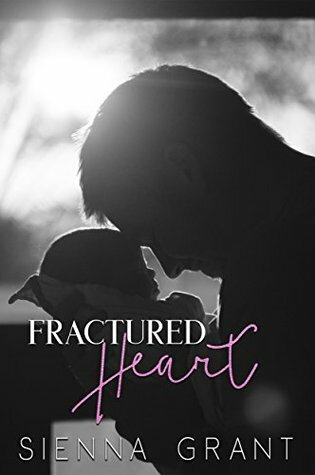 Fractured Heart is a soul wrenching story about a man named Owen who lost his wife, Victoria in the worst possible way - she died giving birth to their daughter Ella. For the first few years after Vic died, Owen wallowed in grief and despair. He wasn't living, but merely existing, simply on autopilot in the daily routine of looking after Ella and running his business. That is until he meets Grace. She turns his world upside down and makes him feel again and his only reaction is to run for the hills. He is absolutely terrified of falling in love again because not only is he afraid of losing someone else, he is scared that he will forget Vic. An amazing story of loss, finding yourself and moving on. Owen is such a wonderful man & father. Great read of second chances at love and life. Any story not completed will not garner a star rating. The review within the ‘spoiler’ is based solely on the reasons WHY it is a DNF for me. The most compelling reason for risking a read was item 3. I have read some fantastic stories based on this trope that I would highly recommend. And, as unfair as it may seem, I can’t Any story not completed will not garner a star rating. The review within the ‘spoiler’ is based solely on the reasons WHY it is a DNF for me. The most compelling reason for risking a read was item 3. I have read some fantastic stories based on this trope that I would highly recommend. And, as unfair as it may seem, I can’t help but compare this story to those I have read and enjoyed. However, every book I read is compared to others so, this is not something new I do. As a reader, I want both my heart and mind to be engaged. Unfortunately, this one did not deliver for me on both counts. As I stated above, I found myself comparing and contrasting, and came to the conclusion that this was an attempt at a ‘happy’ grief. And, honestly, that is where this story lost me. Grief may try and put on a happy face but always fails. Especially under the circumstances as presented in the plot. In the spirit of fairness, and thinking maybe it was me, l set it down —repeatedly. I tried to re-engage by skimming to further spots, and sadly, still could not connect with the H or with the overall story. This lack of engagement and facing my first ever DNF romance book had me analyzing. In order to engage both organs- heart and brain- for an immersive read, I need for the story to‘show me’ and not ‘tell me’. The best description I can offer is that the story read like an exposition. I was offered facts and recounts of scenes without any emotional connection. Wondering if it was me or the writing style, I downloaded several excerpts by the same author. Which lead me to the conclusion hers is a writing style that does not connect with me personally. So why bother with writing a review? Although I did skim and read sections of this novel trying to find something to connect with, I never did. Other readers who have enjoyed this story may not agree, and that’s completely fine. This review is not for them; it’s for those who follow my reviews as we have connection in preference in reading. Connection is important for me to love a story and lack of is why I could not finish. Want a book that will rip your heart apart and put it back together? Read this one. It's beautifully written with a story line that will tear you apart right in the beginning and continue to bring on the heartache as you read this story of a love so strong that when it tragically ends it is painful to read. But the joy that is felt in that instant is also short lived, then returns with the tiny beauty that is the culmination of that love. It is a hard beginning for the one left behind with the n Want a book that will rip your heart apart and put it back together? Read this one. It's beautifully written with a story line that will tear you apart right in the beginning and continue to bring on the heartache as you read this story of a love so strong that when it tragically ends it is painful to read. But the joy that is felt in that instant is also short lived, then returns with the tiny beauty that is the culmination of that love. It is a hard beginning for the one left behind with the new life that now becomes his reason to live, but the grief is so hard to deal with that he puts his true grief on hold to give his all to their little daughter and raise her alone. As time passes and the Ella grows, Owen has returned to work and tries to have as normal a life as he can and has Ella in daycare until she want's to begin to take dance lessons. Enter the beautiful, petite, bubbly Grace who stuns him as much as he stuns her. She is attracted to him and the more she watches this man with his little girl, the more she finds him attractive. But then he also finds Grace just as attractive and begins to think that maybe after 4 years it is time for him to move on with his life. But things are as easy as they seem when when the two begin to date and their attraction becomes a bit more. He hasn't told Grace about Victoria (his wife) yet and Grace is a bit curious about why she hasn't been around, only him with his daughter. She is a bit afraid that she will return to his life and she will be left with a broken heart when he decides to give their marriage another try. When he finally tells her the story she understands and tells him that she will do whatever she can to help him move on. The only problem is that she may not be capable of giving him what he really needs to move on. Only he can do that. The first thing I thought when I started reading was did I miss something, what happened and then I was done for. I didn't stop, I didn't pause, I barely breathed as I became consumed by this book, no not by the book but by the characters. I have this love/hate thing going on with this author because she does this and does it well. She introduces you to her characters in the boldest of manners and then she uses their story to reel you in hook, line and sinker. Owen was devastated when he lost hi The first thing I thought when I started reading was did I miss something, what happened and then I was done for. I didn't stop, I didn't pause, I barely breathed as I became consumed by this book, no not by the book but by the characters. I have this love/hate thing going on with this author because she does this and does it well. She introduces you to her characters in the boldest of manners and then she uses their story to reel you in hook, line and sinker. Owen was devastated when he lost his wife but that's not enough for this author no she makes you feel his pain. The pain he experienced with every breath. And then she makes you fall in love with his relationship with his daughter and just breaks your heart all over again. But no, that's not enough. Then he takes her to dance class and yup you guessed it she gets you again. what a fantastic emotion filled read by sienna Grant. I fell in love with Ella and Owen right from the start. this book gave me chills, made me laugh, cry and swoon all at once. This is a heart touching story. It is full of emotion and following Owen as he overcomes his grief. Life is full of ups and downs for Owen, and you feel everything he goes through. This is yet another incredible book by the talented author Sienna Grant & my favourite read yet!! It is a beautifully, well written, heartbreaking book that will take you on a roller coaster of emotions that can change in a split second. I don't want to give anything away apart from saying that you will definitely want to one click this beautiful book on release day. Congratulations Sienna, absolutely loved this story. Ahhh I have no words for how amazing this book is!! Owen suffers a loss that no one ever wants, his wife passes away and he is left with a baby girl to look after. He struggles through the years never really dealing with his grief just concentrating on his daughter, until he meets Grace. Grace is a dance teacher, she loves teaching. When a new little girl starts, she is instantly attracted and intrigued by her Dad but he seems to want to keep her at arm’s length. When the two meet up on a night out with friends Owen decides to ask Grace out on a date, but is he ready to move on? Can he move past the guilt he feels at falling for another woman? Will they both be able to weather the storm? This is my first book read written by this author and I was impressed with the intensity and rawness of this story. I will keep this review spoiler free because I don’t want to ruin the readers experience. It does deal with loss, and mourning of a loved one. Beautifully written with a seamless plot that flowed well. A storyline that made me weep a few tears. It’s a gut wrenching story that made me feel so many emotions. This is a must read. Standalone told in a dual POV with an HEA. Reviewed on behalf of Amo's book corner. Words cannot describe how much I enjoyed and loved this book. Five stars isn't enough to give this book. The story follows Owen who is a broken man when we first meet him. He loses his wife in the most heart breaking way, she dies while giving birth to their daughter Ella. So every year on Ella's birthday Owen is reminded of his wife and all the memories that they shared. For the next four years Owen is in a trace just getting by cause he has to look after Reviewed on behalf of Amo's book corner. The story follows Owen who is a broken man when we first meet him. He loses his wife in the most heart breaking way, she dies while giving birth to their daughter Ella. So every year on Ella's birthday Owen is reminded of his wife and all the memories that they shared. For the next four years Owen is in a trace just getting by cause he has to look after not just himself but his daughter too. Then comes Grace who charges into Owen's life. Grace is a dance teacher who takes on Ella in her dance class. They instantly feel something for each other. But Grace doesn't know about his wife, they become closer as the story develops and my goodness you'll cry so many tears during this I know I used quite a few tissues. Wow! I really have no clue where to start. It's taken nearly a week from finishing the book to be able to write this review! The book hangover has been huge! This book starts with such a heart-wrenching scene, that my own heart was nearly fractured. Sienna has really outdone herself with this book in so many ways. Owen and Grace are such beautifully broken characters, that you can't help but to warm to them and you are able to feel all the emotions that they go through in the book. Ella.. she is a Wow! I really have no clue where to start. It's taken nearly a week from finishing the book to be able to write this review! The book hangover has been huge! Ella.. she is a beautiful little girl with auch a spark and zest for life, and dance, That your heart breaks little by little with her quirks and mannerisms, especially how she always wraps her arms around Grace's leg at dance class! I love the connection between Owen and Grace, and once he realises how he feels, those emotions are just so raw! If you love Sienna's work, this is a must read book for you, and if you haven't read Sienna's work before, take yourself on your debut ride with her by reading this book. 5 stars certainly is not enough for this book! Another sensational read from Sienna Grant. I loved this book, it was a rollercoaster of emotions from start to finish, like most Sienna Grant novels, be prepared with klennex close by. The plot had me enthralled, I sat up into the early hours as I couldn't put it down, the characters are adorable and these some steamy chemistry. This is the beautiful love story of Owen and Grace. You meet Owen on what is both the best and worst day of his life, the day his daughter is born and he looses the love Another sensational read from Sienna Grant. I loved this book, it was a rollercoaster of emotions from start to finish, like most Sienna Grant novels, be prepared with klennex close by. The plot had me enthralled, I sat up into the early hours as I couldn't put it down, the characters are adorable and these some steamy chemistry. This is the beautiful love story of Owen and Grace. You meet Owen on what is both the best and worst day of his life, the day his daughter is born and he looses the love of his life, his wife.Several years later we meet Grace, when Owen take his daughter to dance class. Later that week they meet by chance while out with friends. This starts an attraction that becomes more over time, they face several challenges and alot of emotion as they try to work out where they want this relationship to go. I loved Fractured Heart by Sienna Grant. It was an emotional and sweet read all at the same time. The characters were so easy to take to your heart as you follow them on a journey of working through grief and finally feeling strong enough to move on. Owen loses his wife during childbirth leaving him to bring up their new born daughter all alone. At first he finds it difficult to cope with his loss b I received a complimentary copy of this book through crazy Cajun Book Addicts for an honest review. Owen loses his wife during childbirth leaving him to bring up their new born daughter all alone. At first he finds it difficult to cope with his loss but four years later he meets Grace, his daughters new dance teacher. Grace is like a breath of fresh air, there's an instant attraction but the big question is, is Owen ready to stop living in the past and finally ready to start a new chapter in his and his adorable little girls life. This book is an emotional ride! Very well written. Great story line. I was hooked right from the start. Emotions on high alert! Owen lost his wife Victoria in the most heart wrenching way! She had a heart attack during childbirth. Owen was left without his wife, but he has a part of her in a newborn baby girl, Ella. Owen was so lost for so long. Fast forward 4 years.... Ella wants to be a dancer. Owen signs her up for classes. Grace is her dance instructor. Owen and Grace have a mutual attraction. However, he doesn’t want to let go of Victoria. Will Grace be able to break down those walls Owen has put up? Must read this book to find out. Oh wow!! Fractured Heart by Sienna Grant was an incredible book that took me on one hell of an emotional rollercoaster. I didn't know whether I wanted to cry, laugh, swoon or smile while reading this book. All I know is it was fantastic and I couldn't put it down. Owen suffered the loss of his wife on what should have been the happiest day of his life. The birth of his baby girl. Now it is 4 years later and Owen meets a young dance teacher named Grace. They have an instant connection and start t Oh wow!! Fractured Heart by Sienna Grant was an incredible book that took me on one hell of an emotional rollercoaster. I didn't know whether I wanted to cry, laugh, swoon or smile while reading this book. All I know is it was fantastic and I couldn't put it down. Owen suffered the loss of his wife on what should have been the happiest day of his life. The birth of his baby girl. Now it is 4 years later and Owen meets a young dance teacher named Grace. They have an instant connection and start to date. But their relationship grows faster then Owen is actually ready for because he realises he hasn't had the time to properly grieved for Victoria.. so they put their relationship on hold until he works though everything he needs to in order to help him move forward..
Can Grace heal Owen's broken heart and show him that it is ok to move on and start living his life?? It's not very often that I read a book that will stay with me forever, but this book sure did! It hits you straight away from page one, I've also never cried at the first few pages of a book, but I did at this! It is absolutely fabulous, in your face, raw emotion, it centers on Owen who looses his beloved wife Natalie in childbirth. He is then left devastated, but with a precious little girl Ella. She is his pride and joy and their relationship is truly beautiful. Ella at the age of four wants to be It's not very often that I read a book that will stay with me forever, but this book sure did! Ella at the age of four wants to be a dancer and when she starts her lessons Owen meets dance teacher Grace, I am not going to ruin the rest of the story, but it's superb. This book broke my heart. Just the prologue had me crying like a baby. Cole is a grieving husband and a brand new father. Having to take care of his little girl all by himself. He never gave himself the opportunity to fall in love again, he didn't want to forget. He's trying to give his little girl everything her mom wanted her to be. Setting her up in dance class was one of the things his wife wished she would do. It's where he meets Grace, Ella's dance teacher. He doesn't want to fall in love, This book broke my heart. Just the prologue had me crying like a baby. Cole is a grieving husband and a brand new father. Having to take care of his little girl all by himself. He never gave himself the opportunity to fall in love again, he didn't want to forget. He's trying to give his little girl everything her mom wanted her to be. Setting her up in dance class was one of the things his wife wished she would do. It's where he meets Grace, Ella's dance teacher. He doesn't want to fall in love, he doesn't want to have feelings. Okay I have to admit that this was my first book to read by Sienna Grant. Let me just say that it will not be my last. This story grabbed my heart and would not let it go. My emotions were all over the place from the very beginning of this story with a gripping and heartbreaking opening and beautiful story to follow. I was so involved in this story, I lost track of time. I felt like I was a part of this world and story these characters were living. They felt real and raw and relatable and I love Okay I have to admit that this was my first book to read by Sienna Grant. Let me just say that it will not be my last. This story grabbed my heart and would not let it go. My emotions were all over the place from the very beginning of this story with a gripping and heartbreaking opening and beautiful story to follow. Wow another 5star read from Sienna. It had me almost in tears within the first chapter. The story is soo powerful and emotional. It starts with Owen suffering a terrible loss of his wife which no one shoud have to experience but also gaining something amazing, his beautiful Daughter. Grace is a dancer who teaches kids and when a new little girl starts she thinks the father is intriguing and hot. But Owen is still fighting his own feelings, he's guilty for wanting to move on. He takes her on a date and realises he's attracted to her but is still unsure of what to do. Will Grace and Owen get together? First time reading Sienna and what a book to start with. This book had me crying, laughing and feeling for the characters from the start. The characters are amazing the way are portrayed. Grace is a ballet teacher and crosses path with Owen when he takes Ella to start ballet lessons. They have this chemistry which neither of them are used to feeling. Owen is a single father after the tragic loss of his wife during childbirth and his focus is mainly on Ella until he meets Grace. Highly recommend th First time reading Sienna and what a book to start with. This book had me crying, laughing and feeling for the characters from the start. The characters are amazing the way are portrayed. I have no words that can say how much I loved this book. Sienna writes with so much heart and emotion you can’t help but feel what Owen and Grace feel. I have to say that the story moved me to tears in places but I wouldn’t change a thing about it. A story about Owen and how he learns how to love and live after losing his wife in childbirth. I would recommend this book to anyone irrespective of what genre they normally read, it’s a sweet old fashioned love story that every woman will love to read I have no words that can say how much I loved this book. Sienna writes with so much heart and emotion you can’t help but feel what Owen and Grace feel. I have to say that the story moved me to tears in places but I wouldn’t change a thing about it. I would recommend this book to anyone irrespective of what genre they normally read, it’s a sweet old fashioned love story that every woman will love to read over and over again. Owen had everything. Until he tragically lost the love of his life and is left to raise their new born child all on his own. Grief consumes him for several years until he meets Grace, his daughters dance teacher. She stirs up feelings inside of him that he struggles to deal with, grief, guilt and heartache. omg this book had me in tears. talk about heart breaking! what do you do when your wife dies giving birth? you try to go on. for years he fought to live. than he met her. will this woman mend his heart? read to find out what happens. It makes me feels that it is still someone out there for me. Thank you for wroting this. Instant fan.